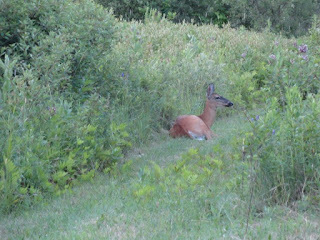 While slowly riding my ATV June 28, 2012 I rounded a bend on my own property and spotted this fully grown doe whitetail resting in my path. I continued to creep forward all the while getting my camera into action. The camera is a Sony Cyber-shot DSC H70. She allowed me to get to approximately forty feet away before rising. 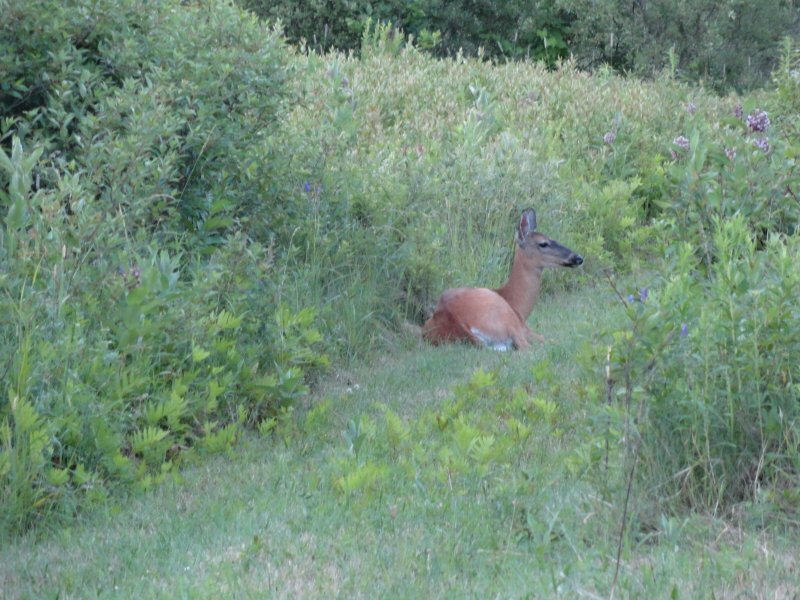 After standing she may have made a noise, but if she did I couldn’t hear it due to the engine noise of the ATV. 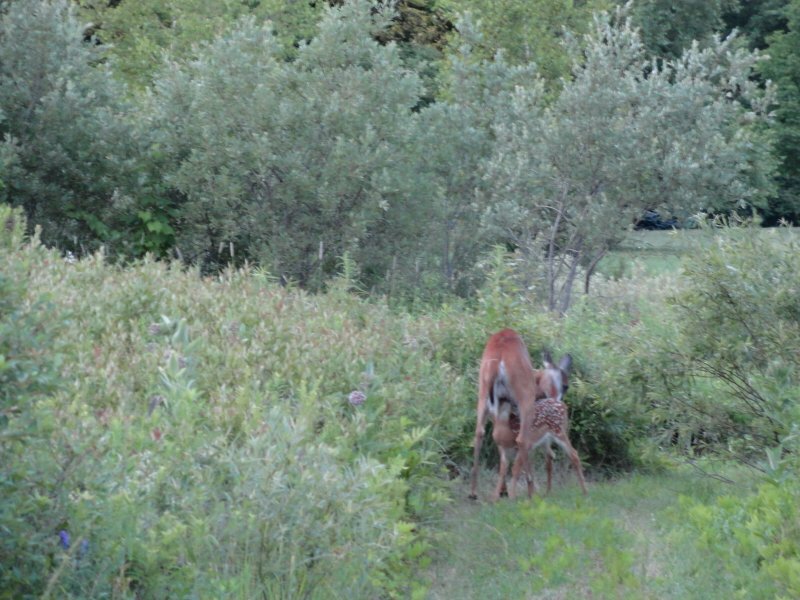 At any rate a fawn came bouncing from the surrounding brush. It seemed rather wary of this intruder, but the mother seemed unconcerned. With mama for protection the fawn gave me a good looking over. It still was not too sure I belonged there. 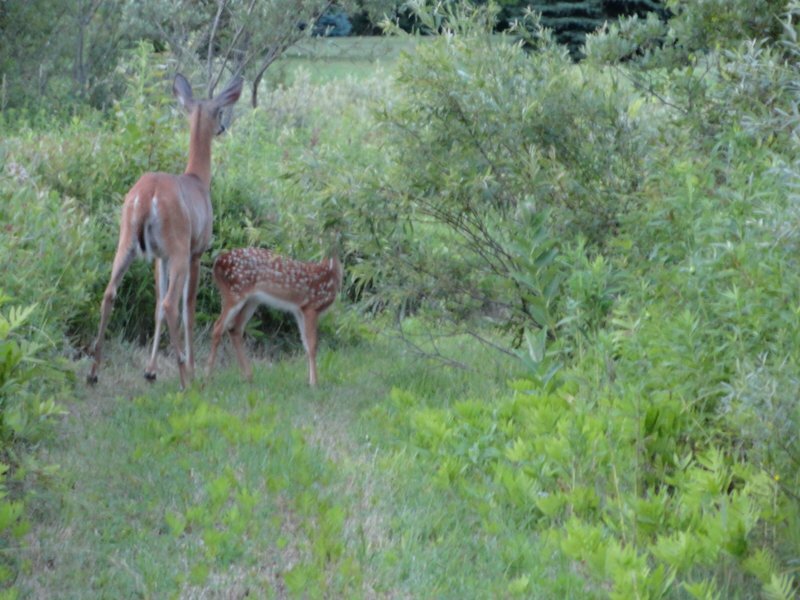 Finally the fawn began to partake of an evening meal. 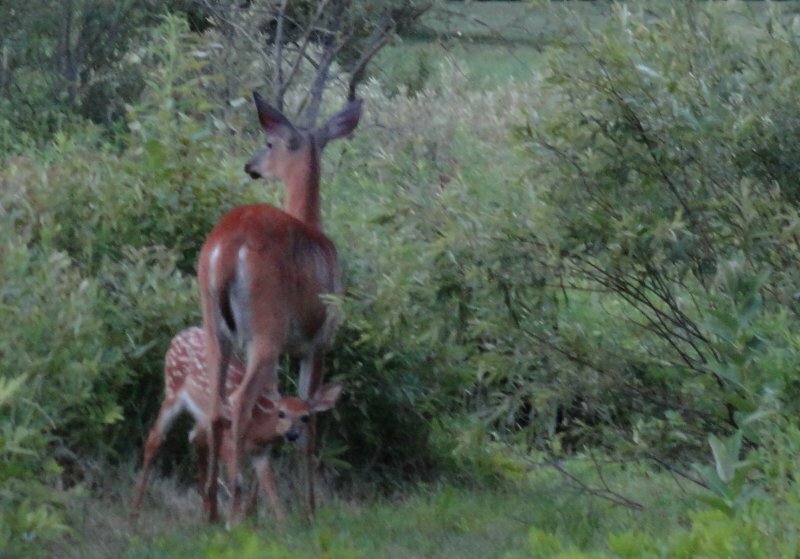 The mother doe took another look at me to insure I was photographing this historic event. Apparently satisfied I was properly recording this, they continued with the feeding program. 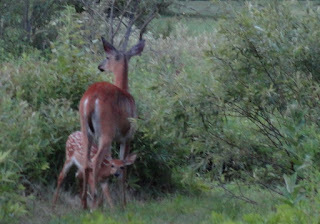 In about five minutes, when dinner was over, they both looked away from me at something only they knew existed. I saw nothing. Soon, like a wisp of smoke, they were gone. When I was a young stripling between the ages of about ten and seventeen, when I joined the US Navy, I was being raised on a New York dairy farm. In summer our entire family spent countless hours processing grass into hay for winter feeding of our dairy cattle. This consisted mainly of mowing the grass, sun-drying it into storable hay, and then moving it from meadow to barn. Day after day in summer we continued this tedious process. It often was hot, dirty, long days of hard labor. Nearly every evening we boys would go swimming in a neighbor’s gravel pit that had filled to a depth of six feet with surface water, when our day’s work was done. While working in the fields during the daytime we often daydreamed of our refreshing dip in the cooler evening hours after the day’s milking was completed. Anticipation may have been as fulfilling as actual fact. As well as the swimming, I nearly always also had the pleasure of meeting a local girl just my age that happened to live very near the old swimming hole. I cannot deny that more than half the pleasure involved had more to do with Kathy than it did with swimming. I was only beginning to understand the pleasure of female company. Today, fifty-seven years after I left the farm to enter the Navy, I drove to the old gravel pit to see for myself what remained of my memories of the good times there. What used to be an acre or so of gravel and sand with the water pool in the center is now a wooded, brushy area with a stagnant pool filled with algae, and clutter of all sorts. Had I not known the difference it would be hard to convince me anyone had ever used that for swimming. As I sat in my pickup today staring at the stagnant pool, remembering what it was like oh so many years ago, it once more reminded me you can never go back. Nevermore will it ever be like it was when you were there the first time. Whatever happened to you Kathy P.? For many years my father worked for the Standard Shade Roller Company. The company manufactured rollers for window shades as the name implies. My father’s job was to fuel the boilers used for heat to kiln dry the wood used in the rollers. Dad worked 12 hour shifts three nights a week as well as a 14 hour shift all day Sunday for a total of 50 hours a week. Normally the company operated on an 8 hour day meaning my father was never there when the company was manufacturing their product. In fact he and an old night watchman named Bill Reader were the only two people on the premises most of the time. There were time clocks located sporadically around and among the various buildings making up the complex. Bill had to make his rounds once an hour. As he came to each clock he was required to punch in to prove he had been there. 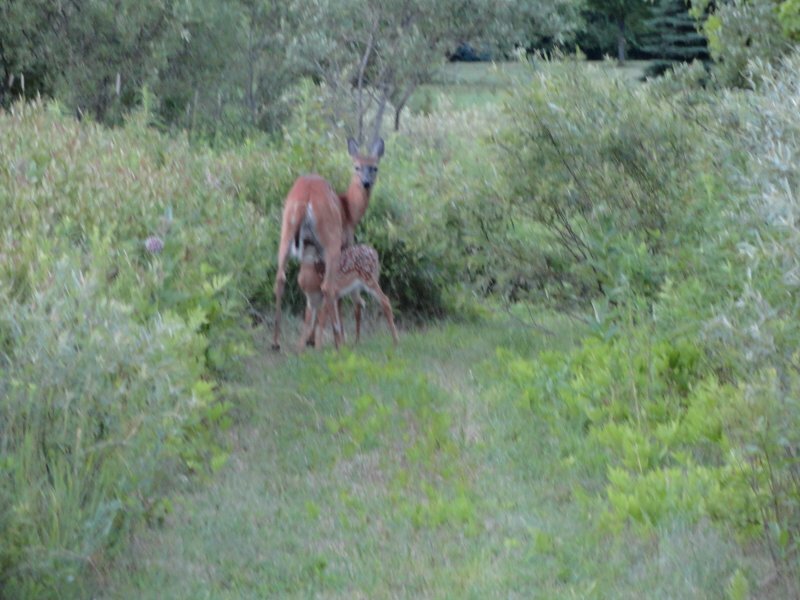 It took him about 45 minutes each hour to make his rounds. A few minutes was spent in conversation with my father each hour. Hour after long hour this repetitious routine continued, day after day, for many years. Most of these tedious hours my father spent alone surrounded by several large furnaces that turned water into steam. The steam was piped to radiators drying the wood used in the roller manufacturing process. Early in his shift each day he had the day’s supply of scrap wood and wooden parts to burn. This required nearly steady shoveling into one of the boilers or another, but after the scrap was gone coal was used. This extended the time required between tendings. Possibly once or twice during a shift father would coordinate the watchman’s rounds with his boiler care chores so that he could nap for a few minutes. Bill on his never-ending rounds, would then wake father to chat for a few minutes before continuing on. Needless to say, father had numerous short periods of inactivity every shift. He read a lot among other things. However, as father was very mechanically inclined he liked to work with his hands, and forever searched for little things to do with a few minor hand tools within his sphere of expertise. One night during the 1950s he found a scrap short piece of the heavy duty wire used to make the round pins for the rollers. 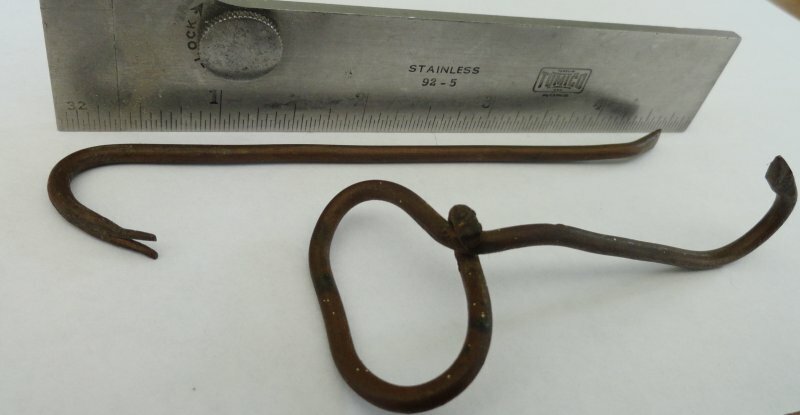 As a farmer he imagined forming the wire into a miniature bale hook used to handle baled hay. Soon one had been bent and sharpened. On yet another occasion he spent some of his idle time forming a carpenter’s wrecking bar. On a whim, one day as he grew older, he gave the two objects, as well as several more, to my brother Ronald. Ron treasured them for many years. One day he showed them to me, the first I knew they existed. I admired them immensely. Shortly before his passing Ron gave these two to me and I treasure them highly. Sometimes I hold them in my hand and imagine how my father sat one night long ago. With little else to do he lovingly formed these small tools and now over sixty years later I feel attached to him because of his labor of love.